Pictures from Mount Rainier National Park to include Reflection Lakes, Paradise, Spray Park, Sunrise, Sunset Park, Yakima Park, Mazama Ridge, Tipsoo Lake, Indian Henry's Hunting Ground, Klapatchie Park, Aurora Lake, St. Andrews Park, Narada Falls, Christine Falls, Edith Creek, Spray Falls, Eunice Lake, Bench Lake, Gobbler's Nob and more! Mount Rainier and pink clouds above Edith Creek. Mt. Rainier above flowers in Yakima Park. Mount Rainier and lenticular cloud above Edith Creek. Mount Rainier above flower meadows on Mazama Ridge. Mt. Rainier reflection at Sunset Park. 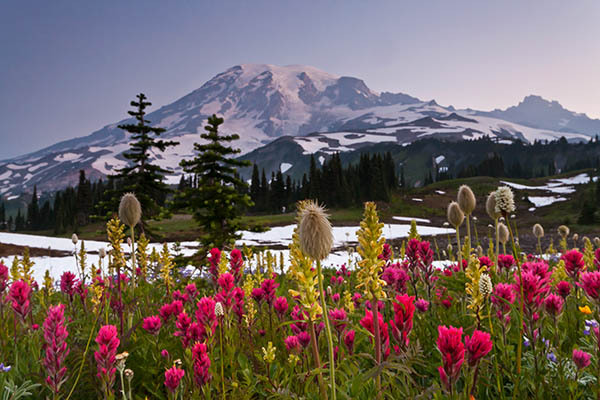 Mount Rainier bove flower meadows on Mazama Ridge. Mt. Rainier above a tarn near Moraine Lake. Mt. Rainier from Shriner Peak. Mt. Rainier above a tarn in Sunset Park. Mt. Rainier above Sunset Park. Mount Rainier above flowers on Naches Peak. Mount Rainier above a frozen tarn. All contents copyright Don Geyer and cannot be used without written permision.